I suppose my weekly update should rightfully be called a monthly update. 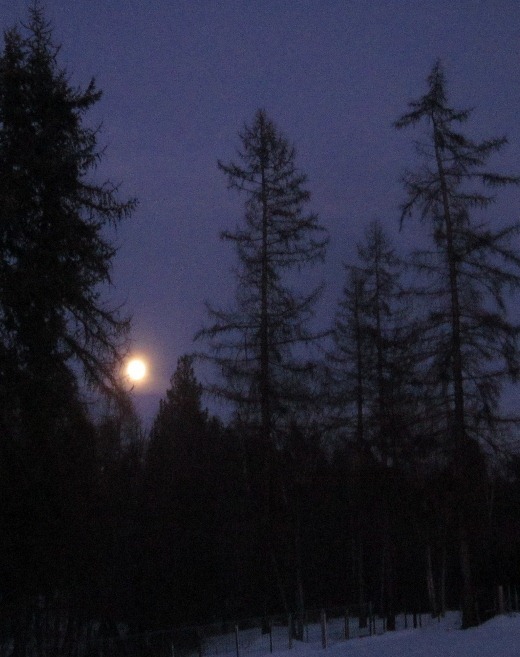 I can’t believe we’re all the way back to the Full Moon again, now in Virgo! Not to be too heavy, but since the last time I posted I was diagnosed with a rare sort of cancer and have had surgery to remove the singular tumor. I spent a week away from most of my family at a large hospital two hours away and am still at the beginning of the recovery-phase. 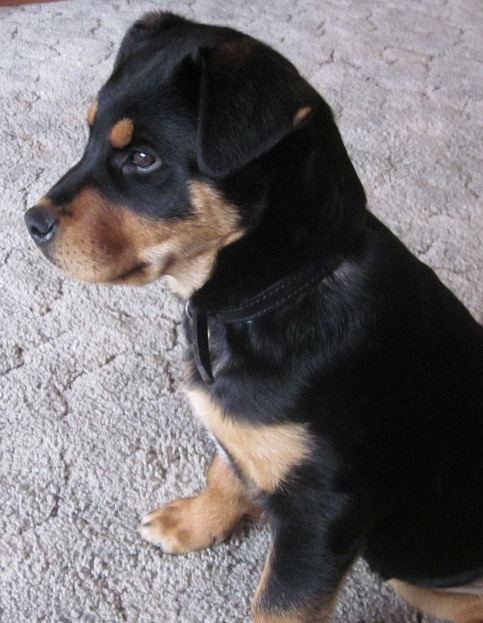 It has all happened very fast, but the prognosis is good. I am feeling both “lucky" and well-loved. I made the decision to go ahead and mention this here because DH and I are convinced it would have all been much worse, and perhaps more similar to what we were told to expect, if it wasn’t for a product called Terramin Clay (Calcium Montmorillonite). This is because we had originally been operating under the presumption that I had a cyst which ruptured beneath my skin and my research was for natural home remedies to draw-together and pull-out an infection of this sort. I initially tried a daily compress of Epsom salts and later a compress of wool-felt soaked in cold-pressed castor oil (i.e. “the Edgar Cayce Remedy”), which may have added to my results. However, we didn’t notice dramatic changes until the Terramin. Based on what I read about the clay I started ingesting a teaspoon mixed into 8 oz. of water or orange juice every morning. I much preferred the taste of it when mixed with orange juice, but mixing the fine powder with water allowed me to brush my teeth with the remaining “grit” in the bottom of the glass. Being gritty and all, you might imagine that it would be too abrasive to scrub your teeth with, but it isn’t. The clay is highly absorbent and any grit turns soft on contact. Studies show that it actually helps harden tooth enamel through remineralization; I found more than one person claiming that it had completely repaired not only their enamel but large cavities as well. Although most commonly used for internal applications, I also started applying a thick paste of it to the distressed area that I would let dry and tighten and pull like a face mask might. This was why I’d purchased Terramin in the first place. I’d read that the negative charges on the clay give it the ability to adsorb or attract positively charged toxic matter like a magnet. It seemed perfectly suited to ridding my body of what I thought was the ruptured cyst. After just four days the affected area was reduced to a third of its former size. It was indeed drawing together and pulling outward! I used clay for the eight days preceding my visit to the doctor, and every day both reduced and condensed the lump. Fast forward to after surgery. Now we know that what we thought was a subcutaneous rupture was really a quickly growing tumor, spreading – and we know that we watched the Terramin Clay reverse the process before our eyes! Even the surgeon reports that the tumor turned out to be surprisingly self-contained, pulling away from the muscle instead of rooting down into it, which in the end was my saving grace from a much worse scenario. So of course I think this clay deserves a study. And a medal. And more people getting to know it. In other news to share, another product. I don’t anticipate that will happen very often. 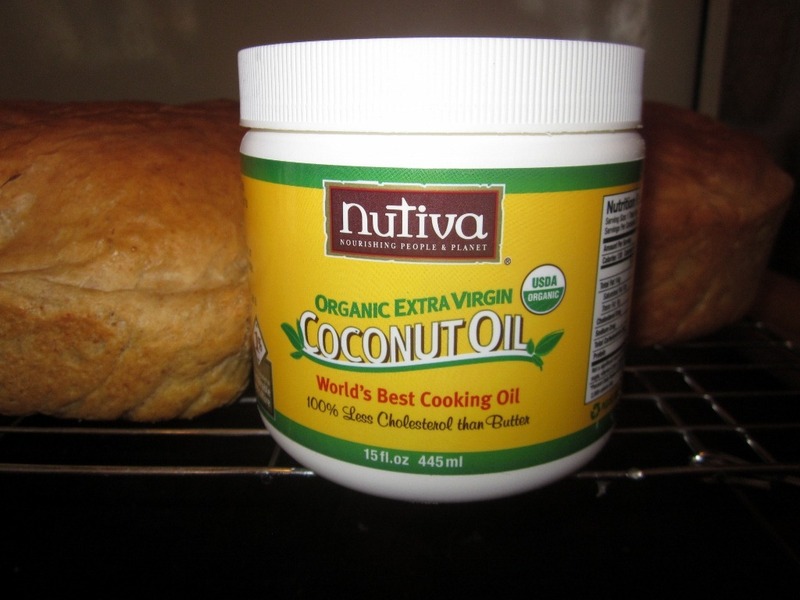 Nutiva Organic, Extra-Virgin Coconut Oil. (I love their Coconut Manna, too, but that’s another story!) I buy it in bulk, two 15 oz. containers at a time. 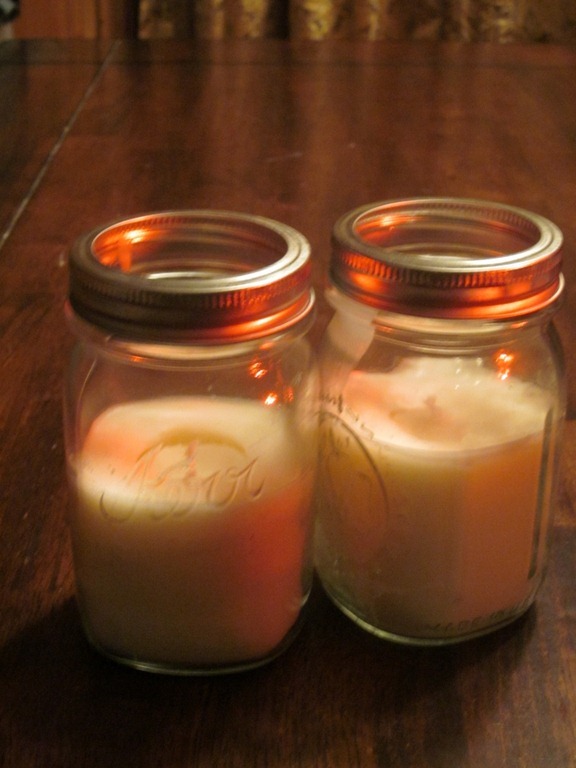 I keep one in a liquid stage and one as a solid and now keep my pantry in a regular supply. When I get down to scraping the edges of the container, I move it into the bathroom shelves because it is a great thing for lips, skin and hair. 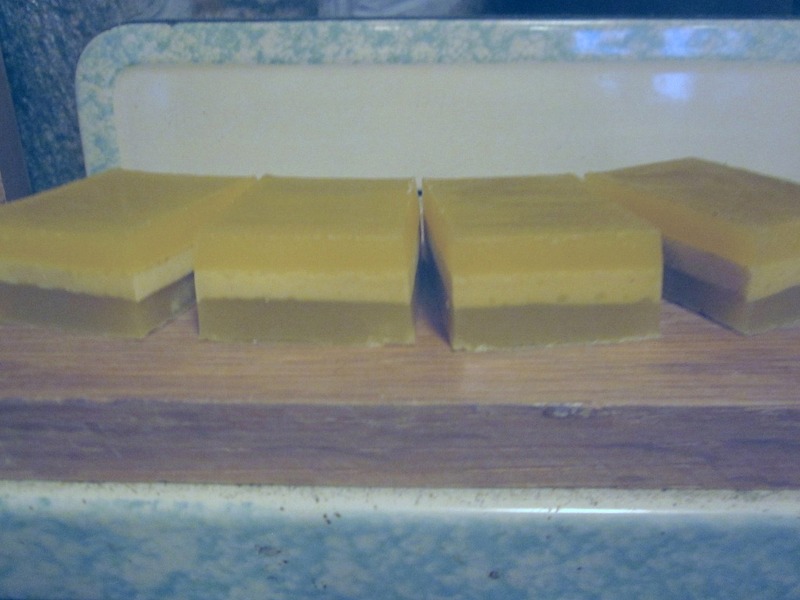 I’ve been experimenting with it in place of butter and shortening in our familiar recipes. I even chilled it really well and made a killer pie crust for the tastiest pot pie ever, and have used it to make a healthier, hint-of-coconut caramel. Using the solid oil in place of butter also turned out to be the final tweak to our everyday, sandwich bread recipe which I’ll share here with you in the coming weeks. Now it is perfect in every way. The oil adds just a faint undercurrent to the aroma and taste, but really softens the loaves without diminishing their slice-ability. My plan is to wake-up at the start of our week and replenish the bread box with that week’s supply. I read of a local mother who makes 16 loaves for her family every Monday morning. My goal is 4 to 6, depending on the weekly menu. 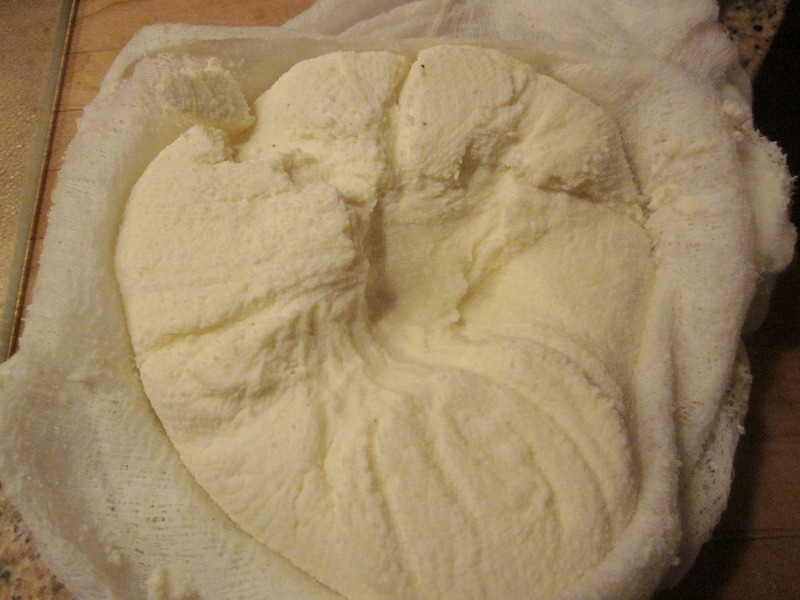 It’s also been on my list to share with you my ricotta success. I absolutely love ricotta but unless I find it on a great sale I usually just substitute a farmer’s cheese because it’s easily on-hand. 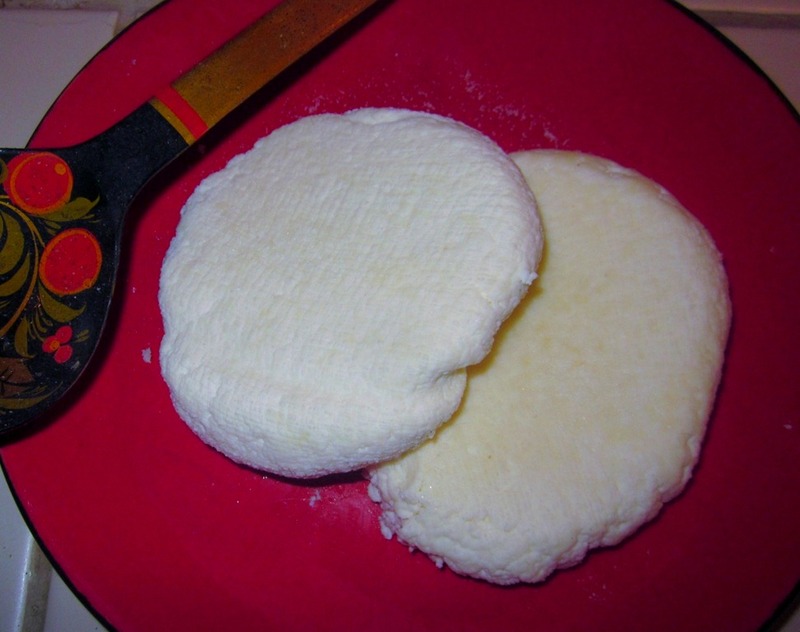 However, where homemade ricotta is creamy and spreadable, farmer’s cheese (like Paneer mentioned in a previous post) is crumbly and has some melt. I used the recipe for Fresh Homemade Ricotta at Epicurious. The second time I made it, I didn’t have the fresh lemon juice and used a mild, white vinegar without thinking too much about it (or I would have used a stronger variety) – but it worked. I’m planning on buying a chinois to assist in making this ricotta and soon, Greek Yogurt. It lets you drain as much whey as possible without losing your creaminess. My son is a Page at the local library, and brought The Northwest Vegetarian Cookbook home for me the day it was put into circulation. He almost skipped it due to its lack of interior gloss, but I’m so glad he didn’t! If you are a vegetarian living in the Pacific Northwest this is a must have book, for all its insight into local products, traditions and seasons of harvest. The only thing that could make the book better is if its pictures were in color and included some shots of finished products. 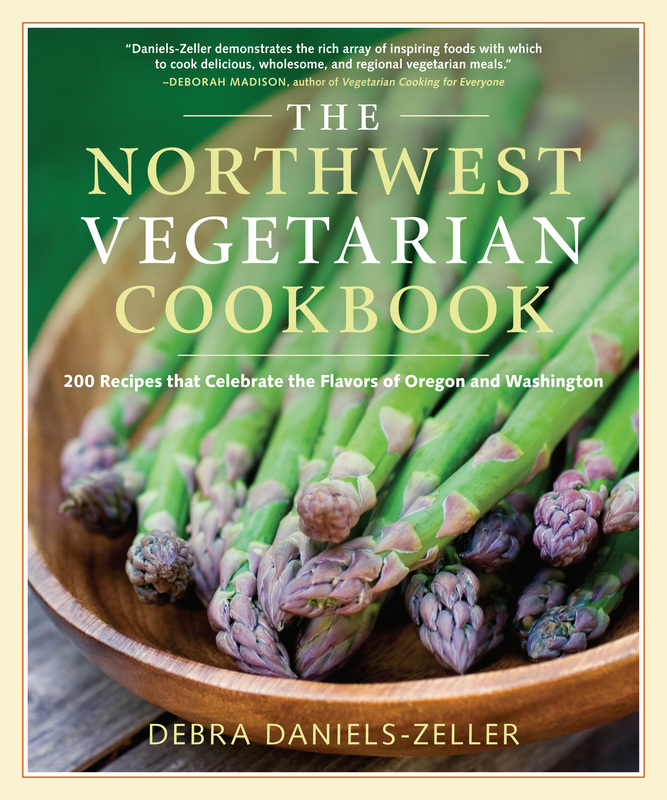 If you are a vegetarian living elsewhere and simply want to indulge in some of the 200 recipes from Oregon and Washington, than this is also your book! The Pacific Northwest produces a wondrous bounty of unique ingredients! Last night my family enjoyed the Wild Mushroom Soup with Sherry, using the Garlic-Mushroom Stock recipe also found in the book, and it was superb just like everything else we’ve tried! And after this, I’m sending the Bake Bean with Hazelnut Bread recipe to my Step-Dad! Know what you are eating! NutritionData.com has been around for almost 7 years, but I only recently rediscovered it while tiding up my bookmarks. Since last I was there, it has been acquired by Condé Nast Publications and gained several handy “Nutrition Management Tools” developed, according to the site, to provide “the most comprehensive nutrition analysis available and to make it accessible to all”. For me, the feature to analyze my own recipes is the coolest! It is simultaneously more straightforward and more evolved than others I’ve used!! There is also a nifty tracker to monitor your daily nutrient intake, if you are so inclined! The source for the data on each individual item is provided in the footnotes of that item’s Nutrition Facts Page, which is appreciated! The origin of the Cultivating Heaven blog was my blog, Heavenly Cooking, where I collected and commented on my family’s favorite Vegetarian and Vegan meals. I’ve been into a Veggie lifestyle throughout various spans of the past 17 years and raised my two-oldest children as Vegetarians back when few around me had heard of such a thing. In 1995 I even managed to have one of my recipes featured in Vegetarian Times, which gave me confidence in my ability to prepare delicious Veggie cuisine. But what I admittedly didn’t understand was that Veggie doesn’t automatically equate with healthy. I was conscious of protein in-take and organic when we could afford to be, there were times when I even grew a good portion of what we ate, but I didn’t start grasping “Healthy” until about two years ago. That’s when I started experimenting the Alkaline diet and incorporating raw foods that weren’t just straight from earth and vine, but actual compositions of raw ingredients. I deleted my old way of doing things and started this blog. And although I recently expanded Cultivating Heaven into a vessel that holds more than just a single aspect of my life, I still intend to share stellar recipes on occasion. Case in point. The other night I made what my DH calls “the best tofu he’s ever ate”. That’s saying a lot because we love tofu at my house! In fact, DH still raves about the teriyaki tofu I served him the first night we met! I call this stellar because it’s both healthy and crazy-delicious!! While the over preheats, rinse and dry chickpeas with a towel. Spread them into a single layer on a baking sheet and drizzle with the olive oil. Evenly sprinkle on the salt and chipotle powder. Squeeze the juice from ½ the lemon over the oiled and seasoned chickpeas. Set aside. Next, get the tofu ready to put into the oven with the chickpeas. Usually I press my tofu well, but not for this recipe. This allows it to have the same baking time as the chickpeas without drying out. Just put the whole tofu block into a small baking dish. 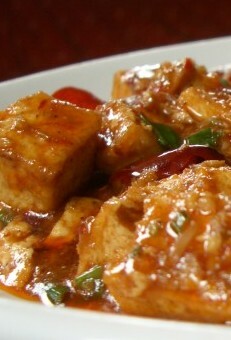 Put the designated quantities of ginger, sesame oil, tamari and sirachi on top of the tofu. Using the back of a spoon, rub it all together and then down the sides. Flip over, and then over again, so that the mixture is generally spread around. This dish has several steps, so make it easier on yourself by taking short cuts like this. Put both the chickpeas and the tofu into the preheated oven for 45 minutes. While these are cooking, melt the coconut oil in a skillet and get your onions sautéing. Don’t forget to salt them. While the onions are working toward the right translucency, start the ginger-peach sauce. I used peaches I’d frozen from the summer glut. They were already peeled and halved, and I didn’t bother to break them down any further. 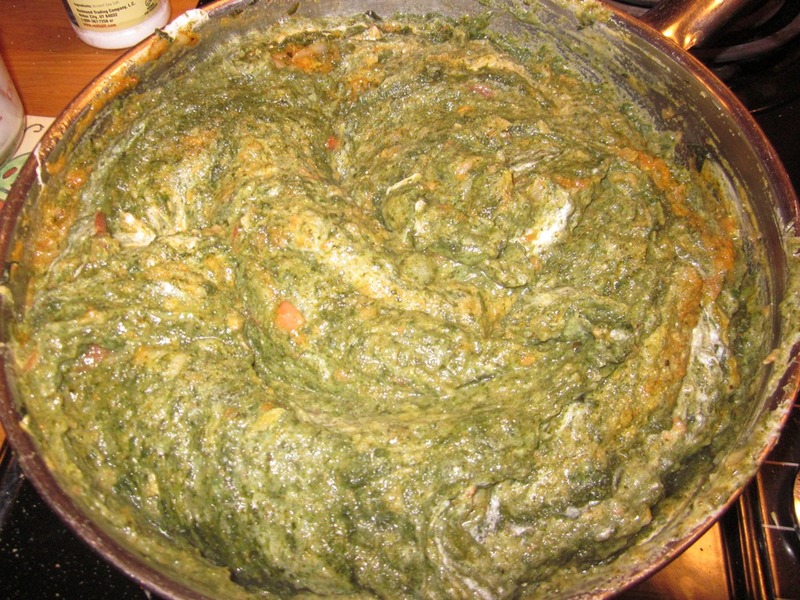 After they’ve cooked awhile a few good mashes with a steel or wooden masher will sauce them just fine! Just pour the water over the peaches, toss in the honey, ginger, sirachi, and salt, give it a few stirs, and bring it up to a low-simmer. You’ll want this to simmer for at least 30 minutes. When the onions just start to stick, deglaze the skillet with the sherry. Cook 1 to 2 minutes more or until any liquid is more of a sauce-like consistency. Remove from heat and set-aside. When your chickpeas and tofu are out of the oven, give the peaches a few good mashes, if they require it. Add in the juice of ½ lemon, roasted red peppers, and the sautéed onions. Heat through. As this is heating, cut tofu into cubes. It will be hot but shouldn’t require much handling. To serve: Make a nice mound of rice or quinoa in a bowl or on a plate. Top with a portion of the tofu. My family is seven strong, so I divide the tofu into 8 portions, leaving a portion for my DH’s lunch the next day. Cover the tofu portion with several tablespoons of the ginger-peach-veggie mixture. Garnish liberally with roasted chickpeas, green onion slices and a generous spoonful of almonds. AMAZING!! I serve this on Boca Burgers topped with a slice of melted Munster, or use it in place of Asian-spices when making Baked Tofu. However, if you happen to be a meat eater this is a great tenderizing sauce that requires no marinating time and bakes wonderfully-thick. 2. Mix in remaining ingredients up to (but not including) the ketchup, whisking to incorporate. Simmer on medium-low five minutes. 3. Whisk in ketchup. If the sauce will be baked in the oven as part of a dish it is ready to use. 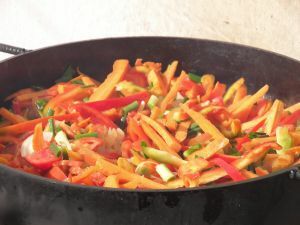 If the sauce will be used as a condiment, then continue simmering for approximately 30 minutes. 5. VARIATION: This is also great with the addition of ½ of a sweet onion, minced; Or try omitting the mustard for more of an Asian inspiration!